An account of the campaign of the French Army of the East under General Charles Bourbaki, defeated by General Carl von Werder's XlV Corps at the battle of the Lisaine. 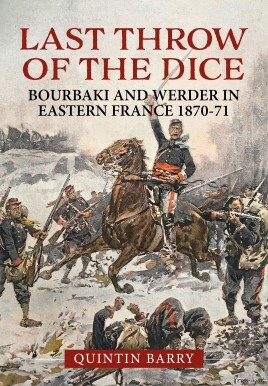 This book recounts the last attempt by the Government of National Defence to reverse the outcome of the Franco-Prussian War, as Leon Gambetta launched the Army of the East under General Charles Bourbaki, the former commander of the Imperial Guard, in a desperate attack on the German lines of communication in South-Eastern France. The plan was that after sweeping aside the forces opposing it, the Army of the East would turn north to cooperate in the relief of Paris. It was faced by the German XIV Corps, which after the fall of Strasbourg had been tasked with overrunning Alsace, besieging Belfort and capturing Dijon. There, it had met and ultimately defeated the corps of Giuseppe Garibaldi, who had volunteered to fight for France after the fall of the Second Empire. The French enjoyed a heavy numerical superiority; but they moved too slowly. A savage battle was fought at Villersexel, but Bourbaki was unable to prevent Werder from taking up a position along the frozen River Lisaine, covering the siege of Belfort. On January 16th 1871 Bourbaki attacked. For three days, in appalling weather, the French tried to break the German line, but in the end fell back defeated. Threatened by a new army which Moltke had created, known as the South Army, under General Edwin von Manteuffel, the French retreated, at first to the fortress of Besancon. As the pressure continued, they fell back southwards towards the Swiss border. In his despair tried to take his own life, but failed, though seriously injured. His successor had no choice but to lead the broken army into internment in Switzerland.